I have fallen in love with William Giraldi. I discovered him haphazardly during an insomnia-fueled whirlwind tour of literary blogs I frequent. Amidst the usual detritus was an essay entitled “Letter to a Young Critic,” which gave me the uncomfortable feeling, described by Emerson in “Self-Reliance,” of seeing my own thoughts and opinions set down on paper with more force and coherence than ever I could muster and yet maddeningly credited to another. I recognized at once in his combative prose and unapologetic tone a kindred spirit, one whose love of literature and defense of aesthetic standards, the long-forgotten core of every reader’s most visceral experiences, would expose him to that cheapest of criticisms: “pretentious.” But to read him, or, indeed, to watch him read, is to see just how misplaced such condemnations can be. But Giraldi is not merely a critic but a writer of fiction as well, someone for whom the task of writing is daunting and who would much rather read a book than write one, which probably explains why Busy Monsters, his first effort, is so belated. My own image of a first-time author tends to include coffee shops and unpaid electricity bills, not a wife, child and mortgage, but he makes up for his delay by delivering a polished and entertaining narrative executed with colorful prose. The story is narrated by one Charles Homar, a memoirist and eccentric (probably a redundancy) whose betrothed abandons him weeks before their wedding in pursuit of a giant squid, a lifelong obsession of hers. Devastated, Homar sets out to recover his lost love and affirm his high romantic ideals. Like his namesake Homer, Charles Homar is a myth-maker, blurring the lines between fact and fiction in the creation of his own narrative, and, like his author, he is prodigiously well-read, a conceit that allows Giraldi to draw upon his vast literary knowledge without straining the plot. Ultimately, this is a picaresque novel in the tradition of Toole’s A Confederacy of Dunces extending back to Cervantes’ Don Quixote, heartfelt enough to sustain our attentions and endear us to his quirky characters and rambunctious enough to keep us laughing. 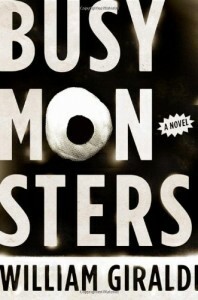 Busy Monsters confirms Giraldi as a novelist worthy of our acclaim and attention, just as his essays and criticism mark him as one of the few young and necessary critics alive today.